A Foley catheter is a soft, flexible urinary catheter that is used in urological diseases to help ease urination in patients with conditions such as prostate hypertrophy, narrowing of the urethra, nerve-related bladder dysfunction, and prostate cancer. It is also known as an indwelling catheter, which is introduced into the bladder through the urethra in order to drain urine. It includes a balloon that holds the catheter in the bladder at one end. The urine is drained into a collection bag by using a catheter tube. Foley catheters can be utilized for prolonged periods; for weeks or even a month. Foley catheters are available in various sizes and balloon capacities. Surge in the geriatric patient pool suffering from urinary diseases is expected to boost the demand for Foley catheters in the next few years. 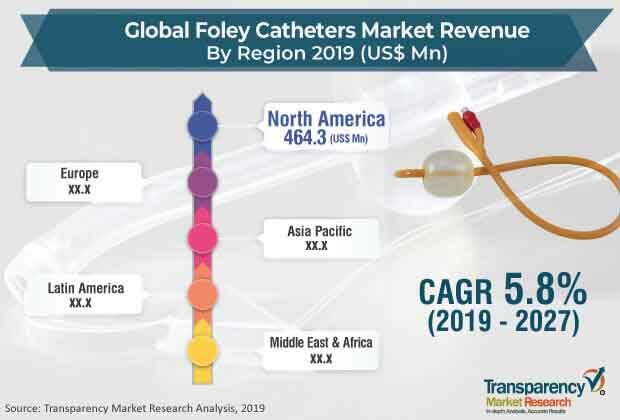 The global Foley catheters market was valued at US$ 1.02 Bn in 2018. It is projected to expand at a CAGR of 5.8% from 2019 to 2027. The global Foley catheters market has been segmented based on product, material, end-user, and region. In terms of product, the global market has been classified into 2 way, 3 way, and 4 way catheters. The 3 way catheters segment is anticipated to expand at a rapid pace during the forecast period, owing to an increase in the demand for 3 way catheters with an extra lumen, which helps instill medications and enables continuous bladder irrigation post urological surgeries. Based on material, the global Foley catheters market has been categorized into latex and silicone. The latex segment held a significant share of the global market in 2018. Latex catheters, when coated with hydrogel, silicone, and Teflon are soft, lubricious, and flexible and offer advantages such as reduced urethral irritation and minimized encrustation, which makes them a preferred choice for clinicians. In terms of end-user, the global market has been segregated into hospitals, long-term care facilities, and others. The hospitals segment is expected to account for a significant share of the global market during the forecast period. In terms of region, the global Foley catheters market has been segmented into North America, Europe, Asia Pacific, Latin America, and Middle East & Africa. North America accounted for major share of the global market in 2018. Rise in urological surgeries performed in the U.S., leading to increase in demand for Foley catheters, is a major factor boosting the market in the country. The market in Europe is anticipated to expand at a considerable growth rate in the near future, owing to the presence of local as well as well-established market players and an increase in the demand for indwelling catheters in hospitals and nursing homes in Europe. The market in Asia Pacific is likely to expand at a significant CAGR during the forecast period. Presence of large geriatric patient pool with urinary disorders in developing countries and increase in usage of latex coated catheters in developed countries of the region are projected to propel the market in Asia Pacific in the next few years. Key players operating in the global Foley catheters market include Coloplast Corp., C.R. Bard (Becton, Dickinson & Company), Teleflex Incorporated, Bactiguard, Cardinal Health, Inc., Cook, SunMed, Medline Industries, and B. Braun Melsungen AG. These companies have diverse product portfolio of Foley catheters along with strong geographic presence across the globe. This report analyzes the current and future scenario of the global Foley catheters market. Rise in prevalence of urologic diseases, such as urinary retention and prostate hypertrophy, across the globe and an increase in the geriatric population are major drivers of the global market. The global Foley catheters market report comprises an elaborate executive summary, which includes a snapshot that provides information about various segments of the market. It also provides information and data analysis of the global market with respect to segments based on product, material, end-user, and region. A detailed qualitative analysis of drivers and restraints of the market and opportunities has been provided in the overview section. Additionally, the section comprises a competitive matrix and company profiles with product portfolios to understand the competitive landscape in the market. This section of the report also provides market attractiveness analysis by region and market share analysis by key players, thereby presenting a thorough analysis of the overall competitive scenario in the global Foley catheters market. The global Foley catheters market has been segmented based on product, material, end-user, and region. In terms of product, the global market has been classified into 2 way, 3 way and 4 way catheters. Based on material, the global Foley catheters market has been bifurcated into latex and silicone. In terms of end-user, the global market has been divided into hospitals, long-term care facilities, and others. The market size and forecast for each of these segments have been provided for the period from 2017 to 2027, along with their respective CAGRs for the forecast period from 2019 to 2027, considering 2018 as the base year. The global Foley catheters market has been segmented into five major regions: North America (the U.S. and Canada), Europe (the U.K., Germany, France, Spain, Italy, and Rest of Europe), Asia Pacific (India, China, Japan, Australia & New Zealand, and Rest of Asia Pacific), Latin America (Brazil, Mexico, and Rest of Latin America), and Middle East & Africa (GCC Countries, South Africa, and Rest of Middle East & Africa). The market size and forecast for each of these regions and countries/sub-regions have been provided for the period from 2017 to 2027, along with their respective CAGRs for the forecast period from 2019 to 2027, considering 2018 as the base year. The research study also covers the competitive scenario in these regions. The report also profiles major players in the global Foley catheters market based on various attributes such as company overview, financial overview, product portfolio, business strategies, and recent developments. Major companies profiled in the report are C.R. Bard (Becton, Dickinson & Company), Teleflex Incorporated, Cardinal Health, Inc., Coloplast Corp., Cook, Medline Industries, SunMed, Bactiguard, and B. Braun Melsungen AG.